The saying goes, you eat with your eyes first. 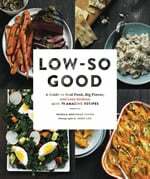 And as someone who lives everyday on a low-sodium and unprocessed diet, I know for certain that a little splash of unexpected color and whimsy can hugely improve the appeal of a meal — as well as distract the tastebuds from needing the over-salted and over-junked taste of processed foods. So when making any dish from scratch — versus from a box or can — I’m always on the lookout for whole foods that naturally spice things up in taste and in looks. And even though fall is known for a rather beige assortment of in-season produce, there is one item that recently caught my eye (and has since become an essential part of my unprocessed toolbelt): purple sweet potatoes. Equally rich in color and in taste, purple sweet potatoes land on the slightly sweeter side of the flavor scale — so much so that my daughter refers to them as “birthday cake potatoes,” especially when I steam them and reheat with a little bit of unsalted butter. Which got me thinking: why not make a homemade cake batter with this wildly hued vegetable as the star? Even better, why not use the sweet potatoes to make a naturally dyed frosting, too? Most store-bought cake mixes contain around 300mg of sodium per serving as well as 18g or so of sugar. And while prepared frosting generally has less sodium (around 100mg per 2 tablespoons), it usually boast upwards 20g of sugar for the same amount. Not to mention preservatives, artificial coloring, and often other non-food sounding ingredients! But sweets do not need to be so bad. By making mixes and frostings from scratch, you get to be in charge. You can keep it decadent and convenient (especially if you already have steamed sweet potatoes in the fridge), all while adjusting the recipe to meet your health needs, cut down on the fake stuff, and even boost the inclusion of healthy ingredients. 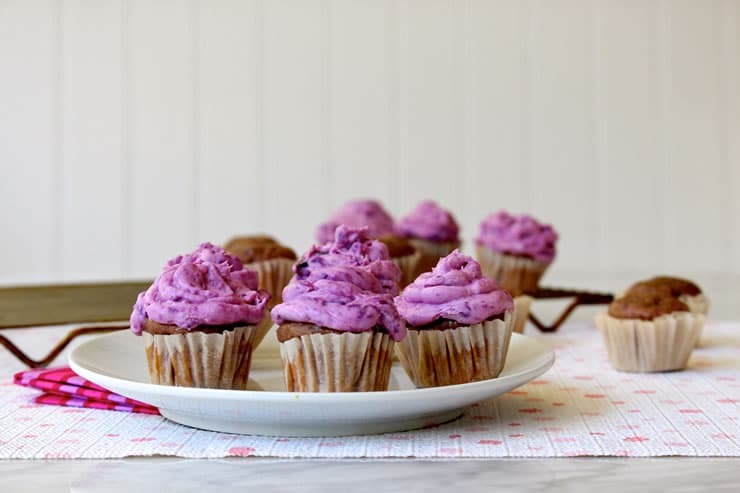 Plus, by replacing the butter and most of the sugar with unsweetened applesauce, and by using kitchen-test approved yogurt as the base of the frosting, you can feel totally fine about giving these cupcakes to your kid (or yourself) for breakfast. And lunch. And as a snack, throughout the week. 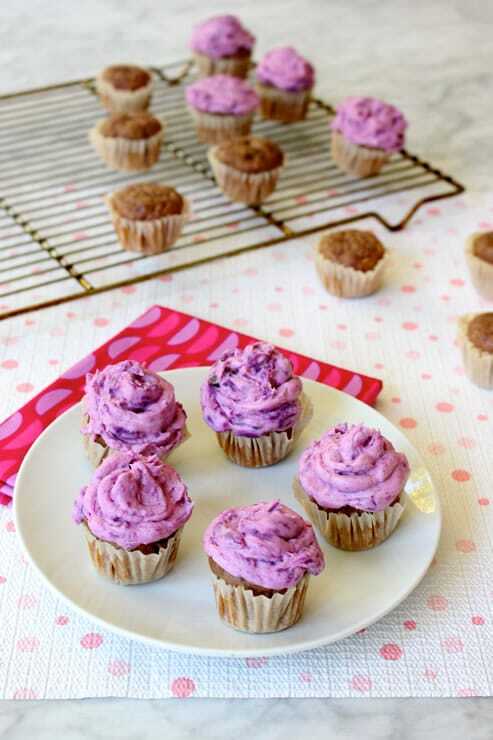 So as Halloween and the end of your October Unprocessed approaches, celebrate with these Mini “Monster” Purple Sweet Potato Cupcakes. And for more colorful, healthy fun, please play around with the recipe. In place of the purple sweet potatoes, use pureed pumpkin for a holiday-appropriate orange version. Or a mix of bananas or Japanese yams and matcha tea for a spooky green theme. Just some fun tricks for this healthy treat! Colorful, healthy, and fun way to enjoy delicious unprocessed sweets. Fill a medium-sized pot with two inches of water and place a steamer basket on top, so that the water sits just below it. Then place the sweet potatoes in a single layer on top. Bring the water to a gentle simmer and cover the pot with a lid. Steam until the sweet potatoes are soft enough to pierce (and mash) with a fork, about 10 to 12 minutes. Transfer the sweet potatoes from the steamer to a bowl or sheet pan and allow them to cool, about 5 to 8 minutes. Remove the skins and then, in the bowl, mash with a fork until smooth and “chunk” free. Set aside. Line a mini muffin pan with paper liners. In a medium bowl, mix the dry ingredients (flour, baking powder, and cinnamon) together. Then, add the egg, milk, sugar, applesauce, 1 cup of mashed sweet potatoes, banana, and vanilla. Mix again until everything is combined and the batter is smooth. Fill each muffin tin 3/4 of the way full with batter. Shake the pan a little to settle the batter. Then place the muffin pan into the oven and bake for 12 to 15 minutes, or until a knife inserted into the middle comes out clean. When done, let the muffin pan rest on the counter to cool. Meanwhile, in a medium bowl, mix the second cup of mashed purple sweet potatoes with 1/2 cup of yogurt. (Note: you may have some leftover sweet potato, so simply save it for lunch or dinner or use as a sandwich spread). Stir until smooth and the “frosting” takes on a uniform purple hue -- although a swirly, marbled look is nice, too! But be careful to not overmix -- you want the frosting to remain a bit thick. Then, use a spoon or spatula to transfer the frosting into a plastic bag or a piping bag, if you own them. If using a plastic bag, push as much of the frosting towards one of the lower corners and twist at the top, removing as much air as possible from the bag. Then snip off the end. When muffins are cool, frost the tops. OMG! Were those Stokes Purple Sweet Potatoes you used? So glad you love them as much as we do over here! Wow! I love regular purple potatoes but have never come across purple sweet potatoes. When I find some–I know exactly what to make! Have you made these in regular muffin size? I’m wondering how they turn out/if they need a little more oven time to properly set up. Please please PLEASE do not *ever* suggest using plastic bags (e.g., to pipe the frosting). The petrochemicals are bad for human health; the trash they turn into screws up the ecosystem; and the wars we engage in so we can procure them are insane. If you don’t own a piping bag, then apply the icing some other way. I mean, *really* — can’t we do with a good-looking, rather than great-looking, edible in the service of human health, the planet, and the safety of people in oil-rich lands? ……. Same goes for foil — mining it is bad for the Earth, and all fights over resources are linked to war and worker exploitation. …… How can you care so much about your own health yet be so cavalier about others’ health, even others’ lives? We MUST end this carelessness about resources.